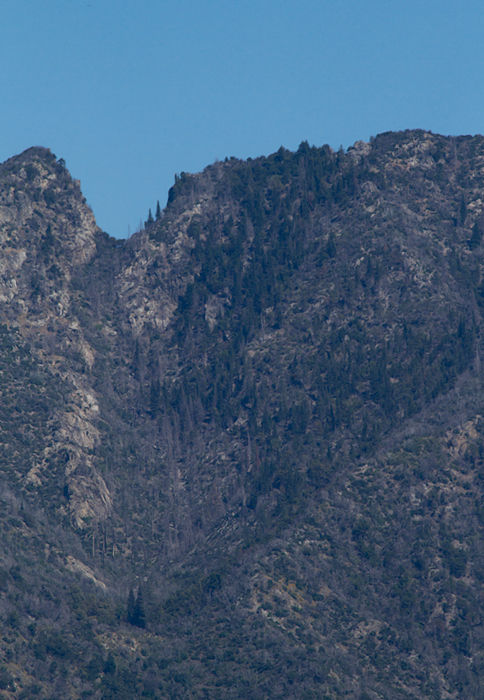 Page 1 of California photos. 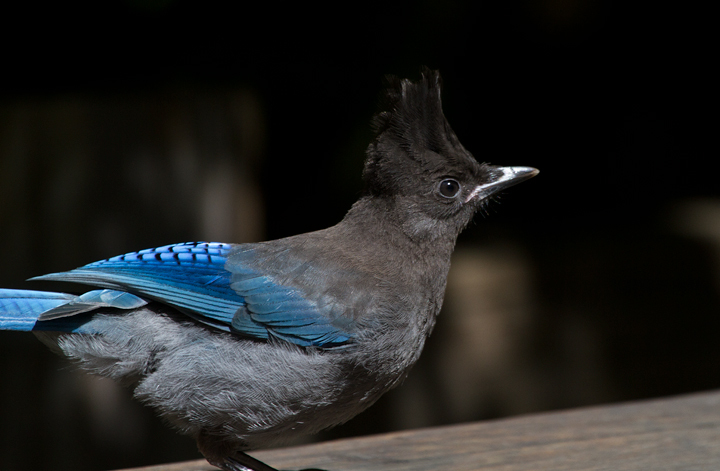 Last updated: 7/10/2011. 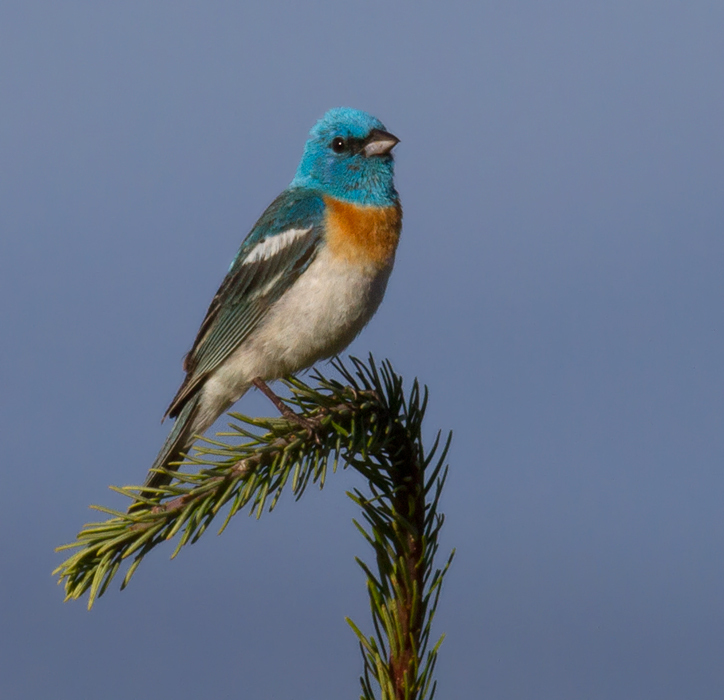 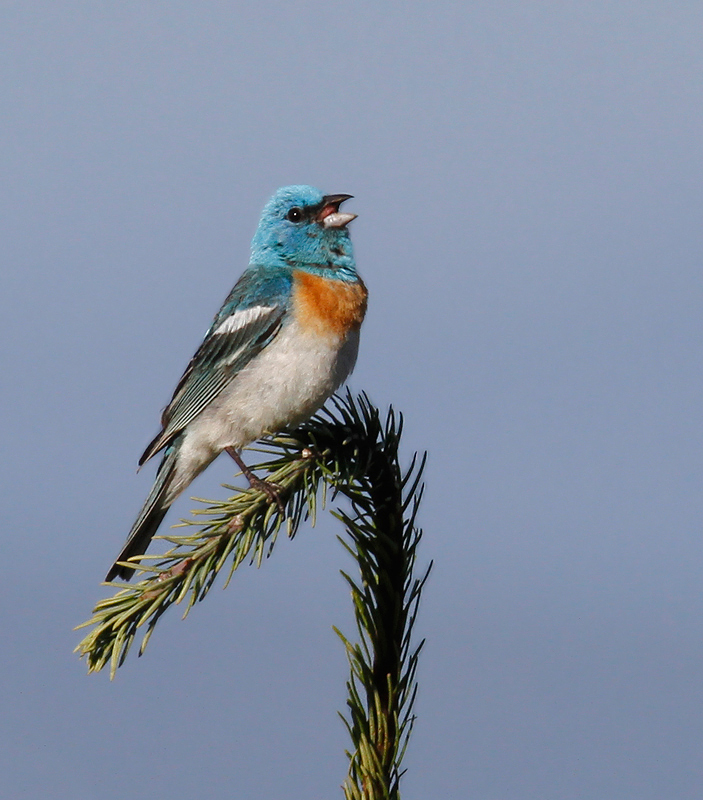 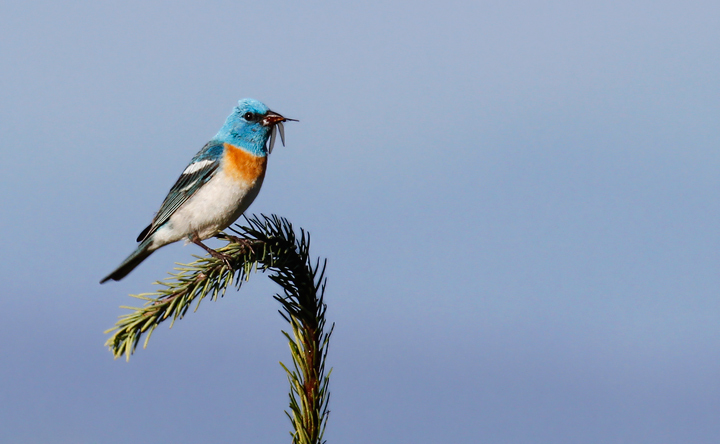 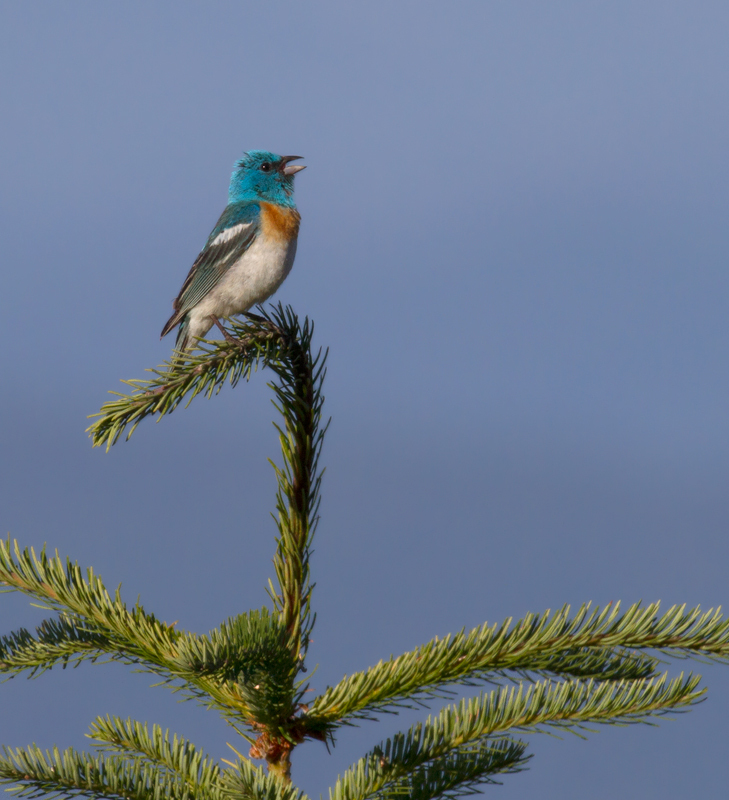 Above and below: A male Lazuli Bunting sings triumphantly from a favorite perch in the hills above Garberville, California (7/4/2011). 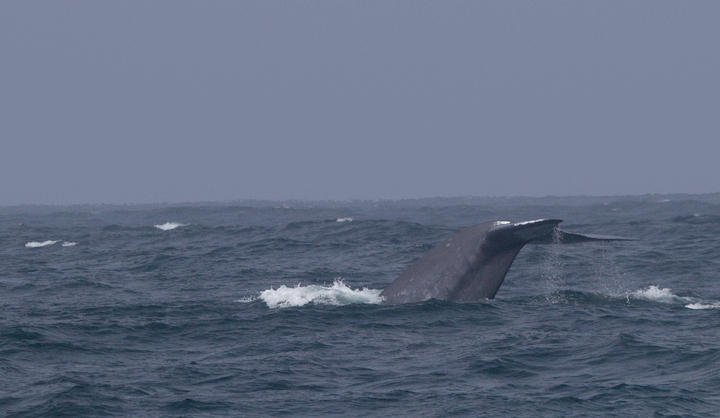 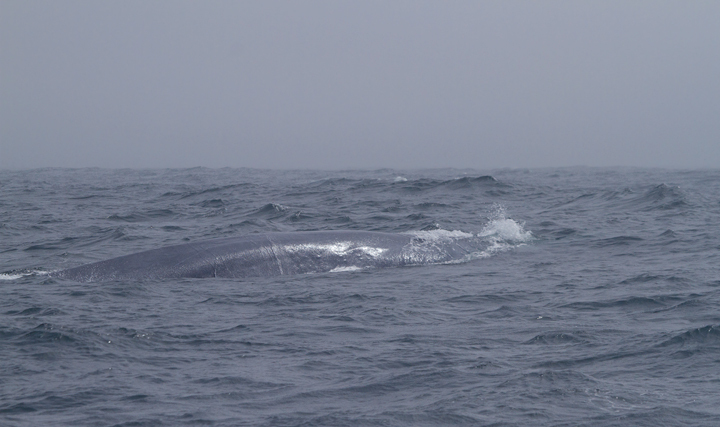 Below: A Blue Whale in Monterey Bay, California - the largest creature that has ever lived! 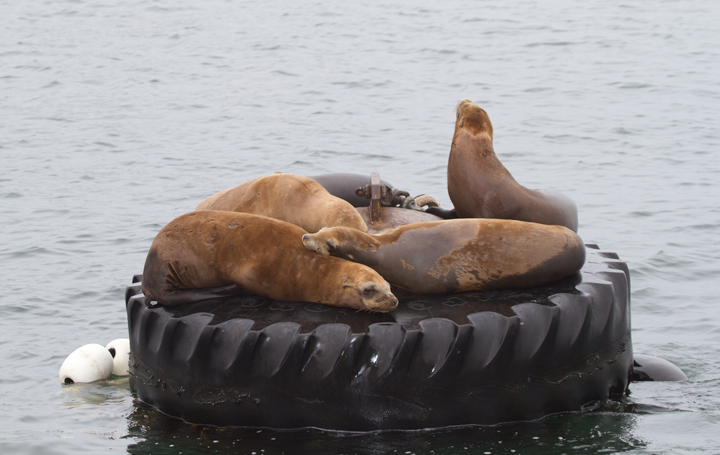 Below: California Sea Lions in Monterey Bay, California (7/1/2011). 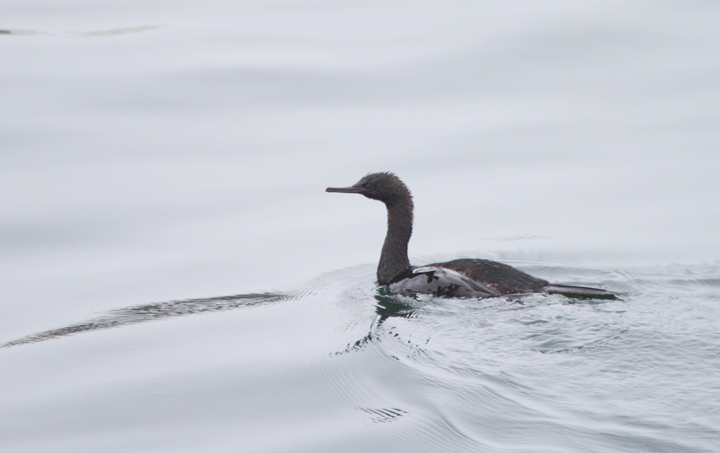 Below: A Pelagic Cormorant in Monterey Bay, California (7/1/2011). 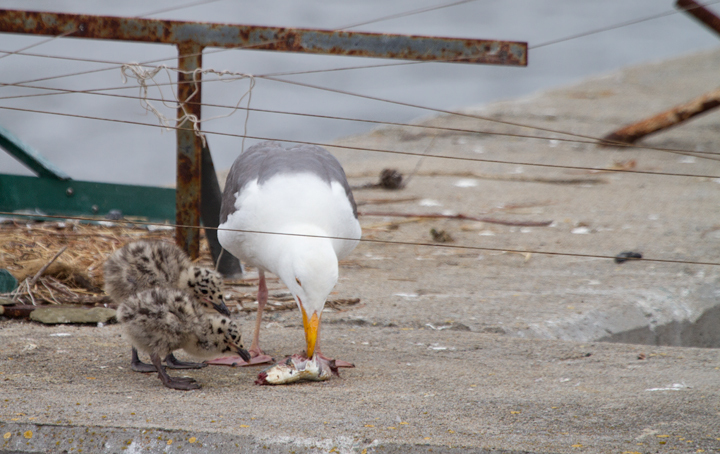 Below: A Western Gull feeds its two downy chicks in Monterey Harbor, California (7/1/2011). 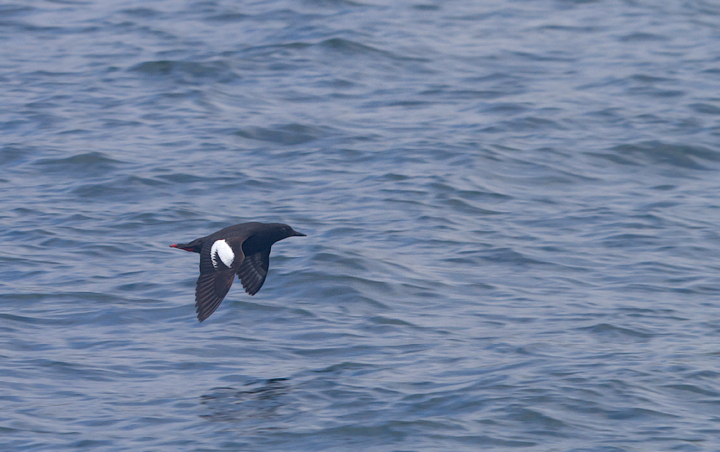 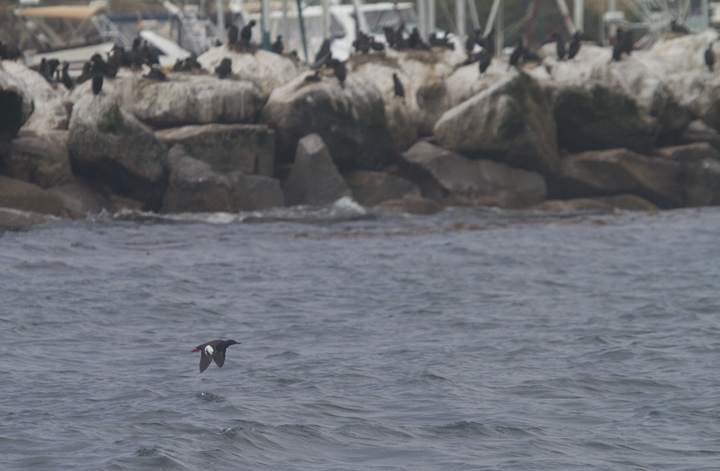 Below: A Pigeon Guillemot in Monterey Bay, California (7/1/2011). 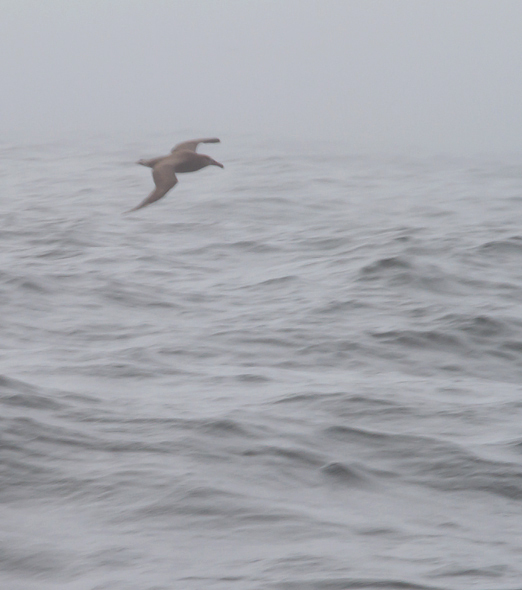 Below: A terribly distant photo of a spectacular bird - my first Black-footed Albatross, soaring through the fog in Monterey Bay, California (7/1/2011). 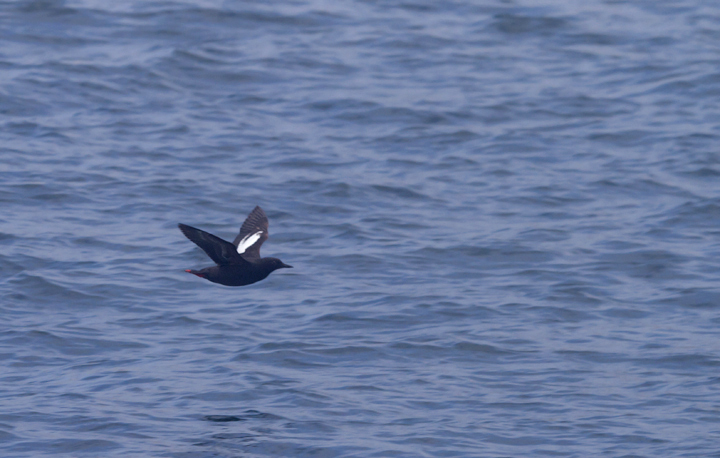 Thankfully the looks were a lot better than this photo suggests! 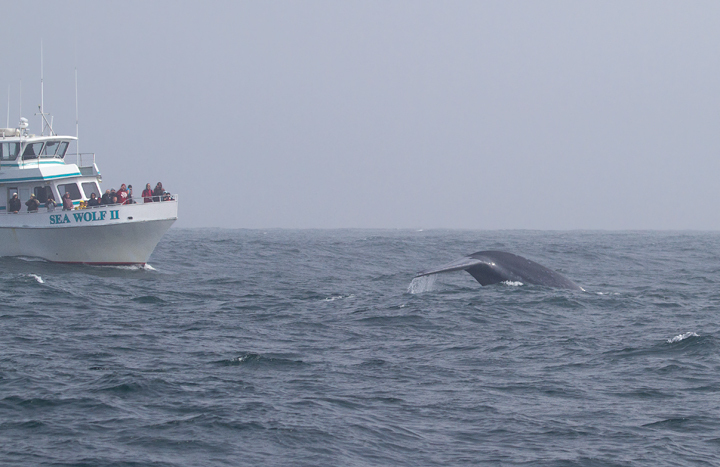 Conditions were pretty challenging for the first half of the trip. 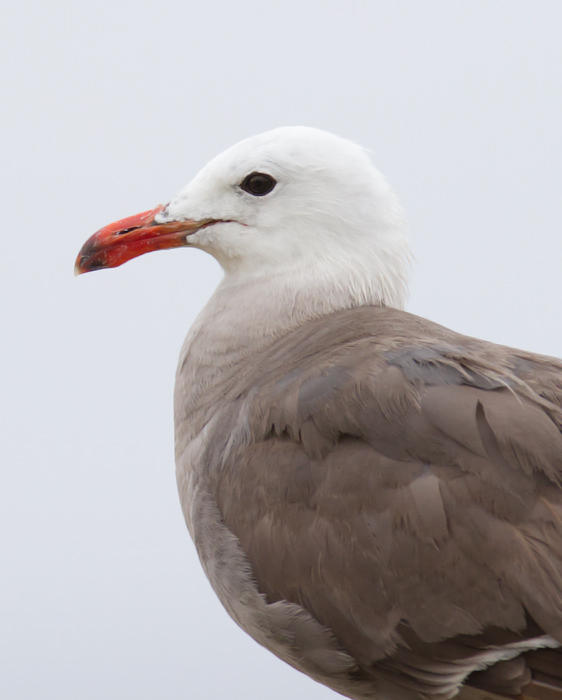 Below: A Heermann's Gull in Pacific Grove, California (7/1/2011). 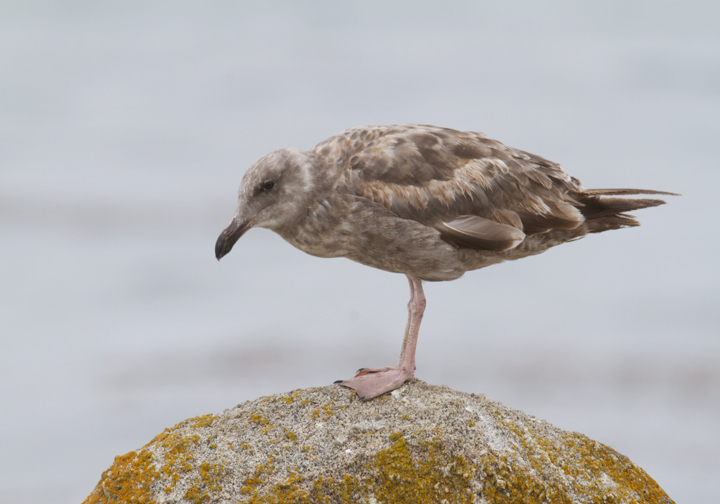 Below: An immature Western Gull in Pacific Grove, California (7/1/2011). 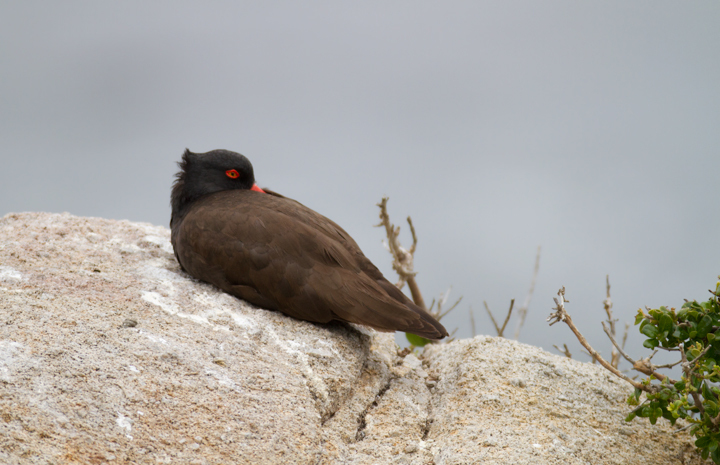 Monterey: such a paradise that even the Rock Pigeons feast on clam chowder bread bowls. 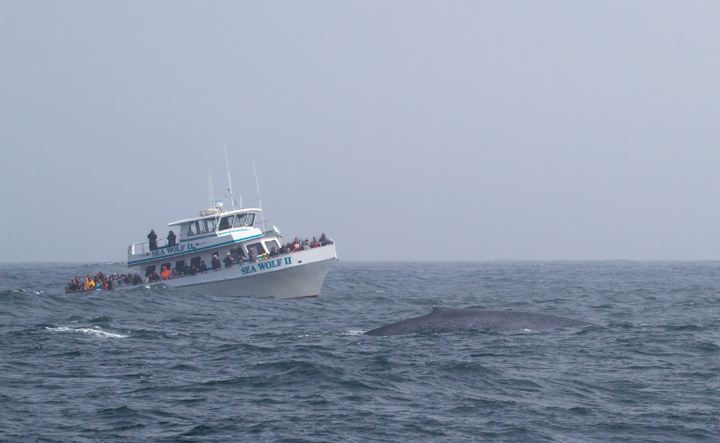 And no, that wasn't one of ours. 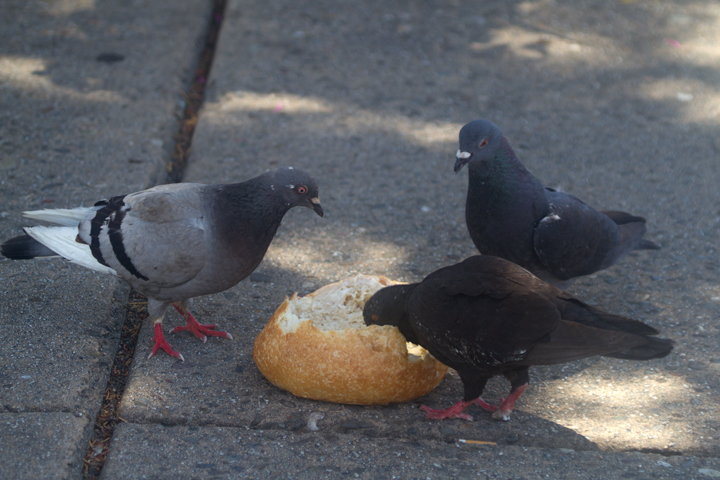 I do not share mine. 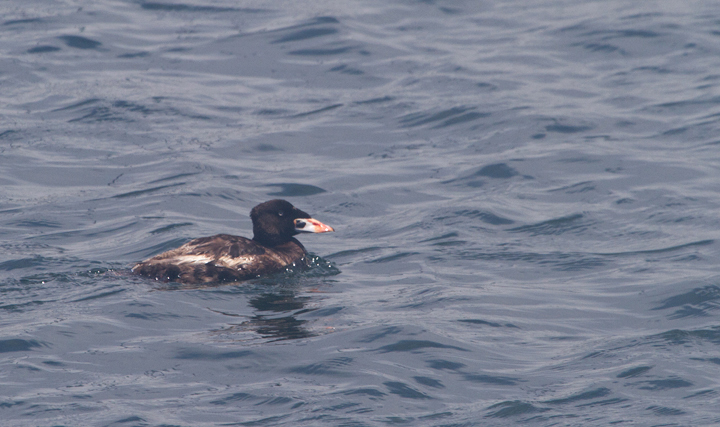 Below: A summering drake Surf Scoter in Monterey Harbor, California (7/1/2011). 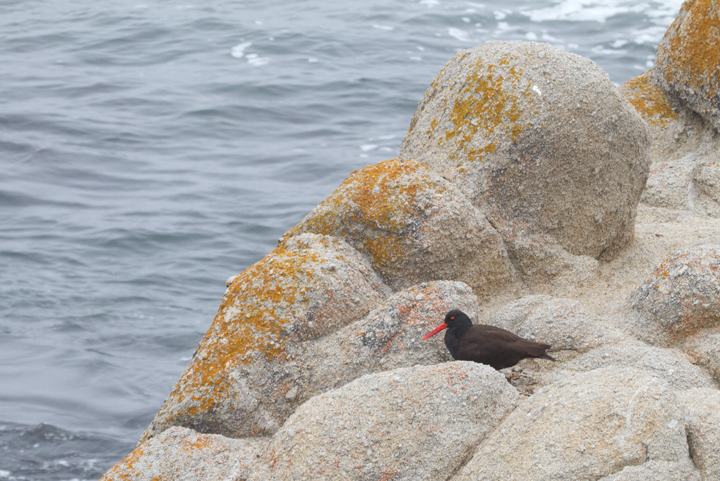 Below: Black Oystercatchers roosting in Pacific Grove, California (7/1/2011). 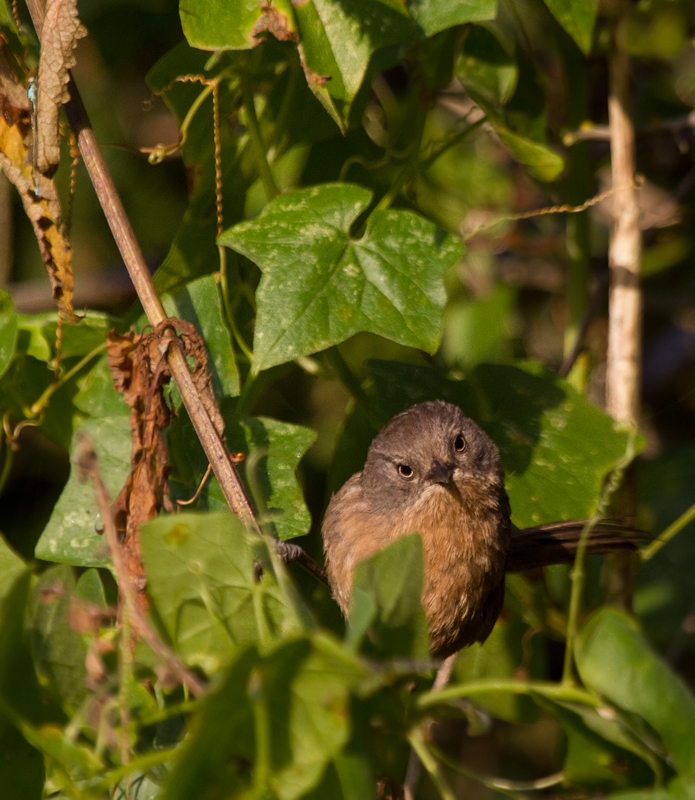 Below: A Wrentit poses for me at Watsonville Slough, California (7/1/2011). 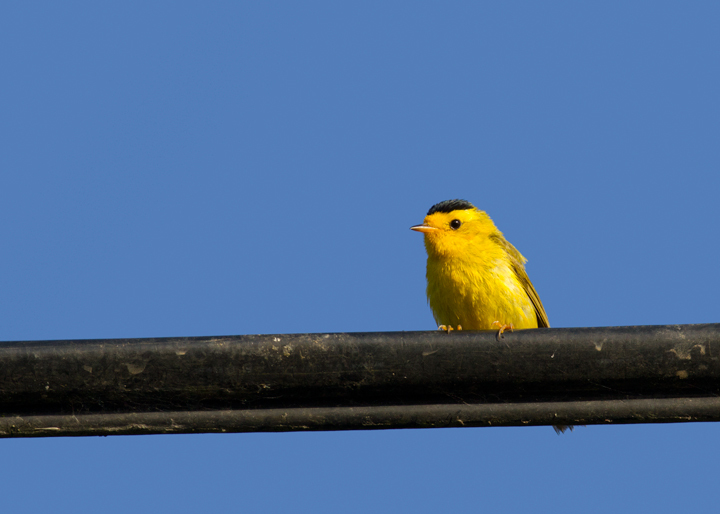 Below: A Wilson's Warbler so charged up that he's singing from a telephone wire in Watsonville, California (7/1/2011). 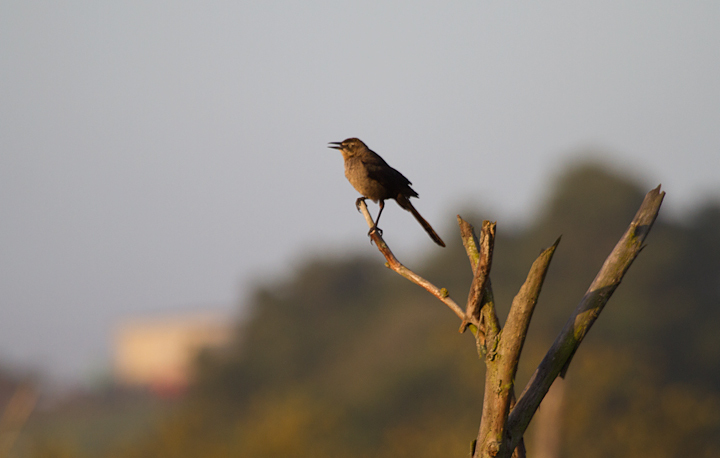 Below: Great-tailed Grackles continue their advance. 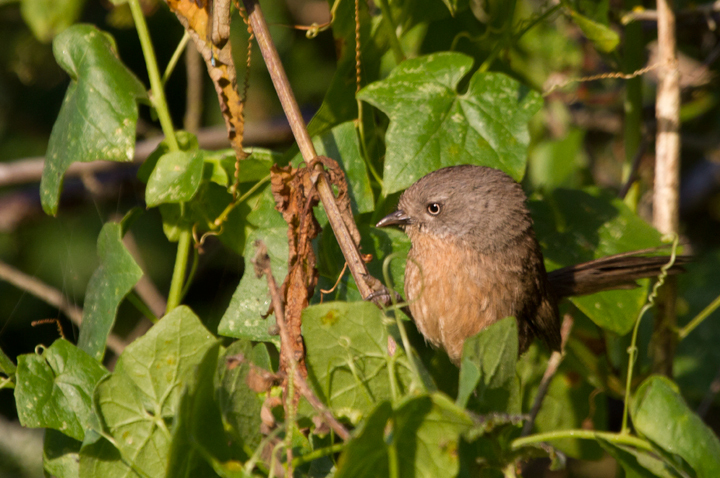 This female is one of several we encountered at Watsonville Slough, California (7/1/2011). 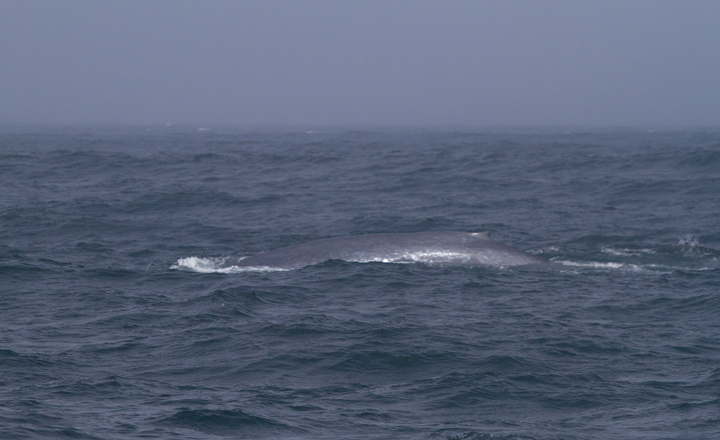 This is the farthest north I have encountered the species. 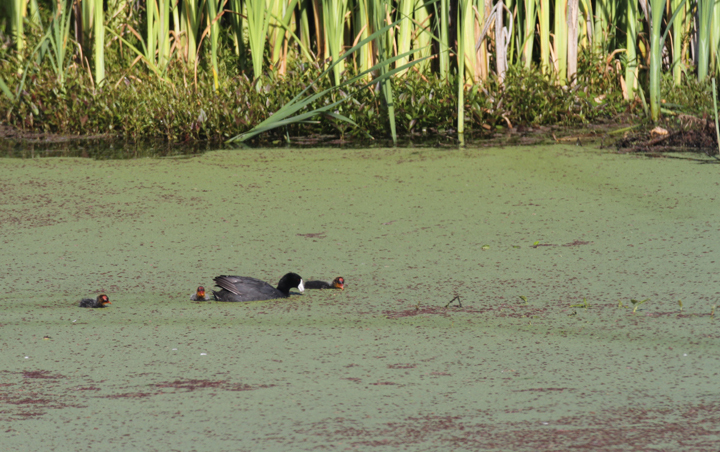 Below: An adult American Coot with tiny young at Watsonville Slough, California (7/2/2011). 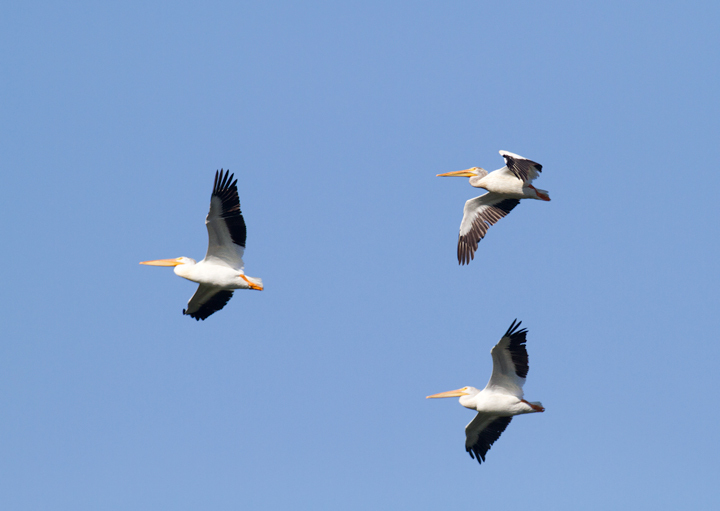 Below: American White Pelicans over Watsonville Slough, California (7/2/2011). 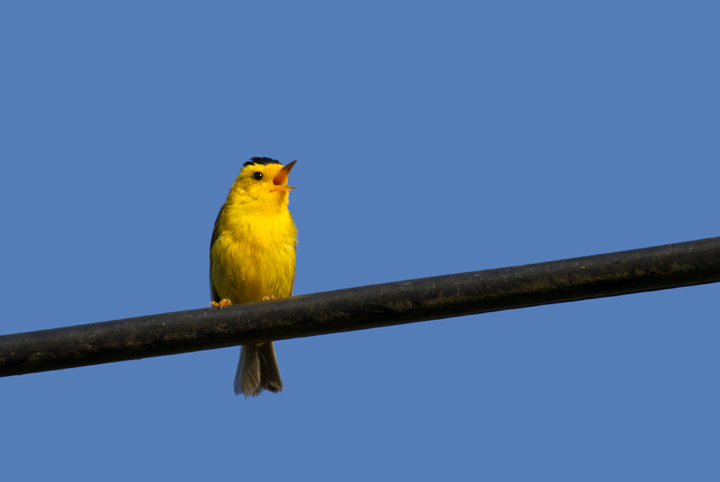 We also had brief looks at a continuing, singing male Lawrence's Goldfinch here. 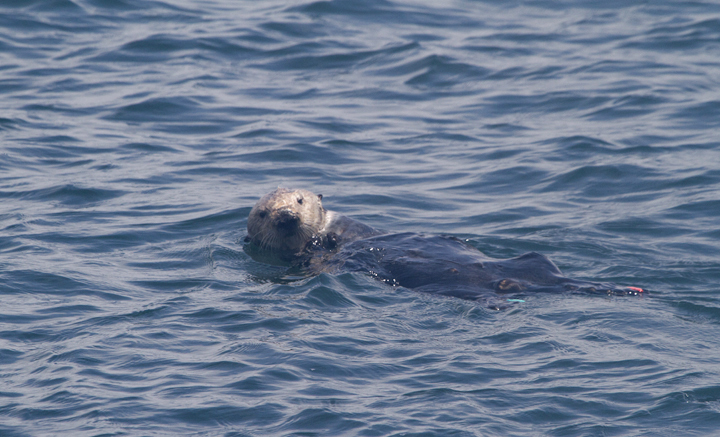 Below: A favorite sight of Monterey Bay, a Sea Otter floating and feasting on fresh seafood (7/1/2011). 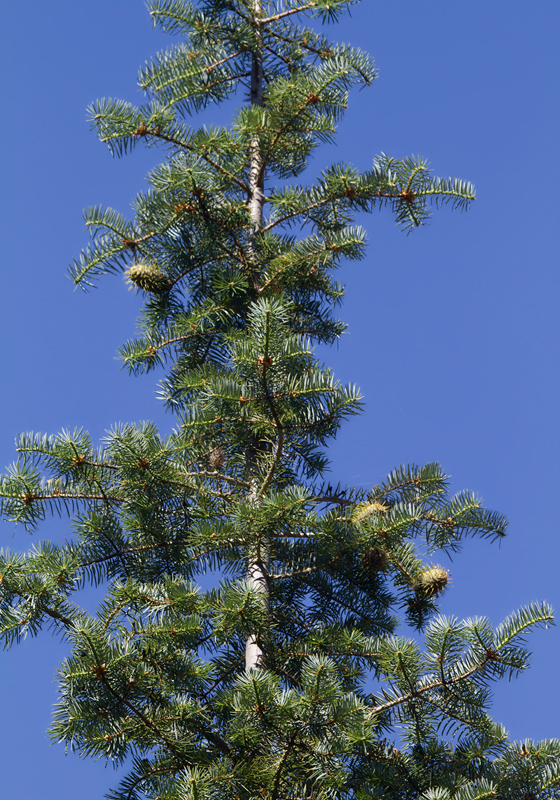 Below: One of the world's rarest conifers, Santa Lucia Fir (Abies bracteata), also known as Bristlecone Fir, at Palo Colorado, California (7/1/2011). 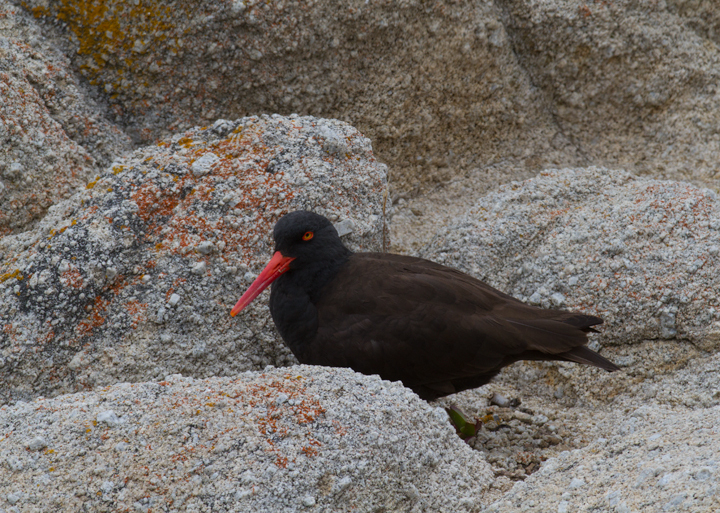 Thanks to local naturalist Larry for pointing these out. 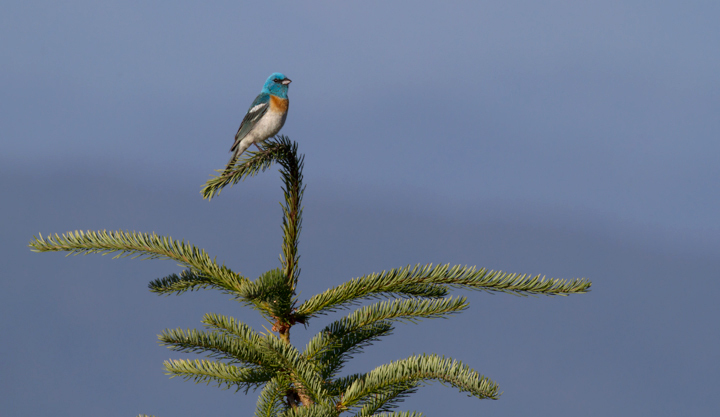 He also pointed out the southermost Douglas Fir in the range. 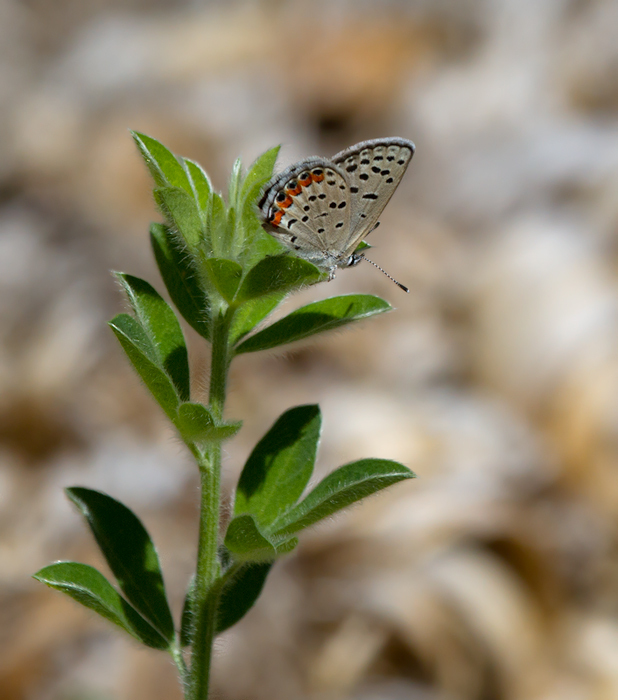 Below: An Acmon Blue at Palo Colorado, California (7/1/2011). 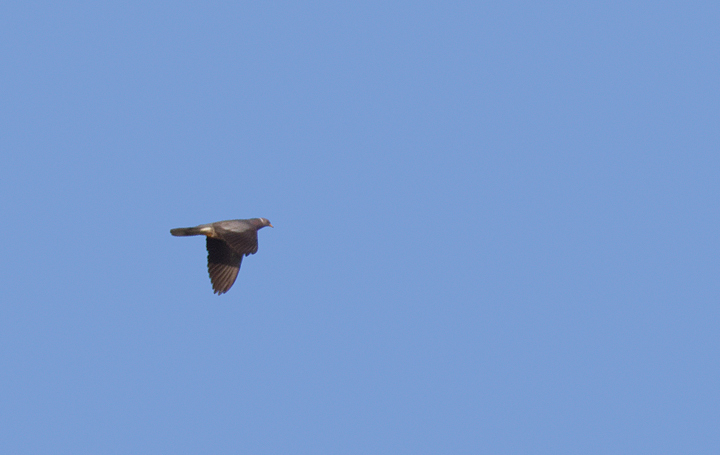 Below: A Band-tailed Pigeon flies past a vista near Big Sur, California (7/1/2011). 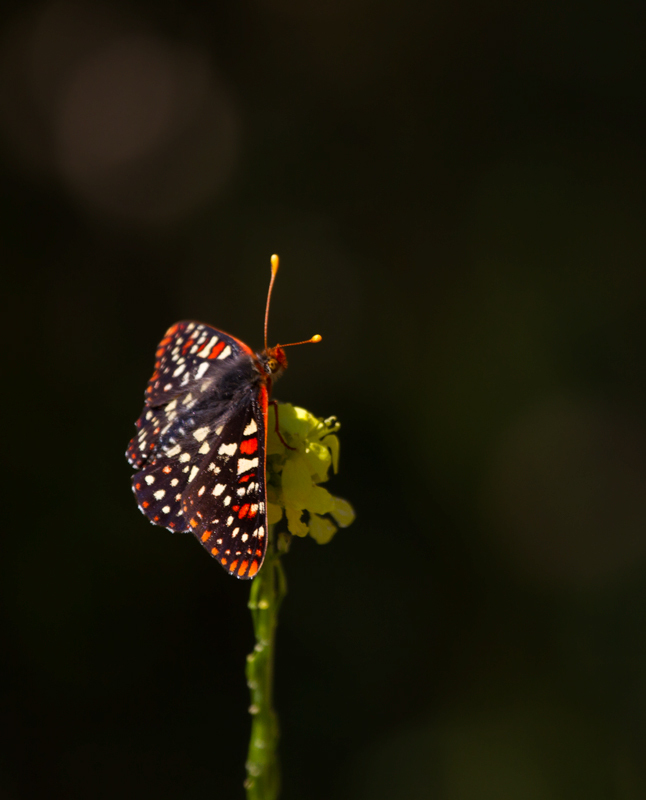 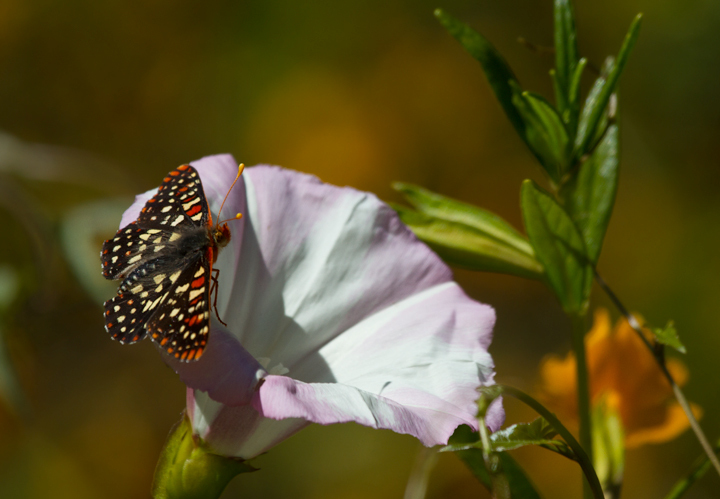 Below: A beautiful Variable Checkerspot at Palo Colorado Canyon, California (7/1/2011). 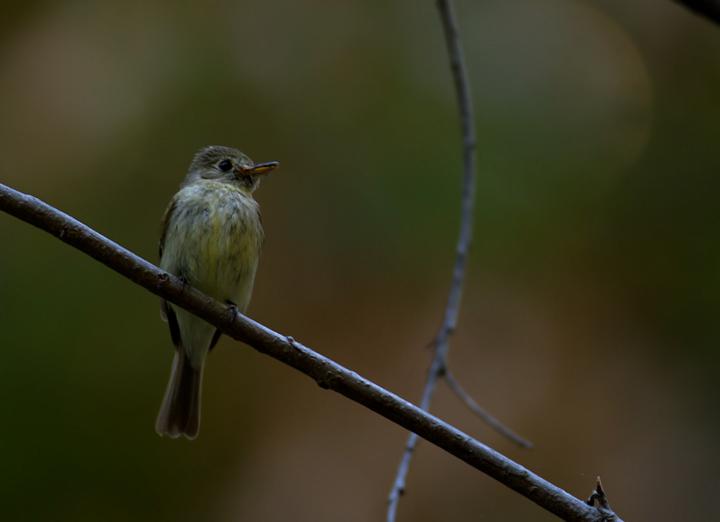 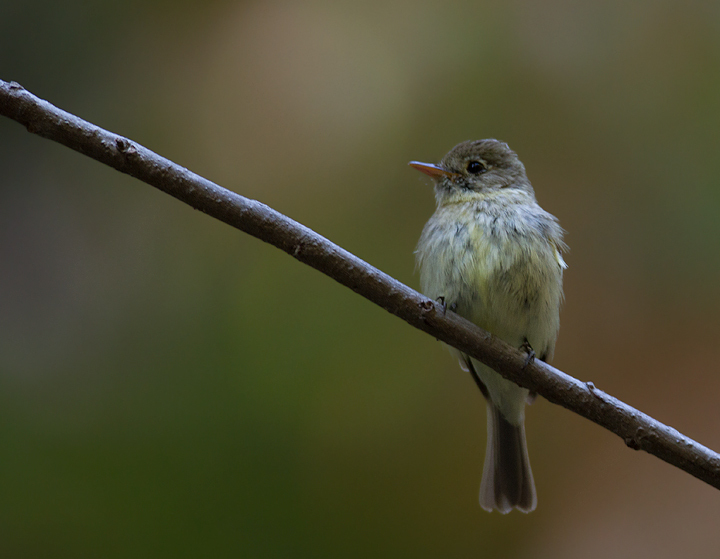 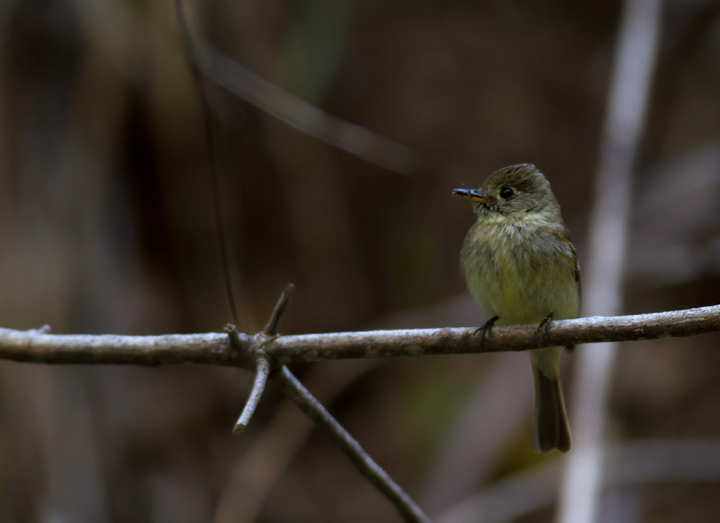 Below: A Pacific-slope Flycatcher in Palo Colorado Canyon, California (7/1/2011). 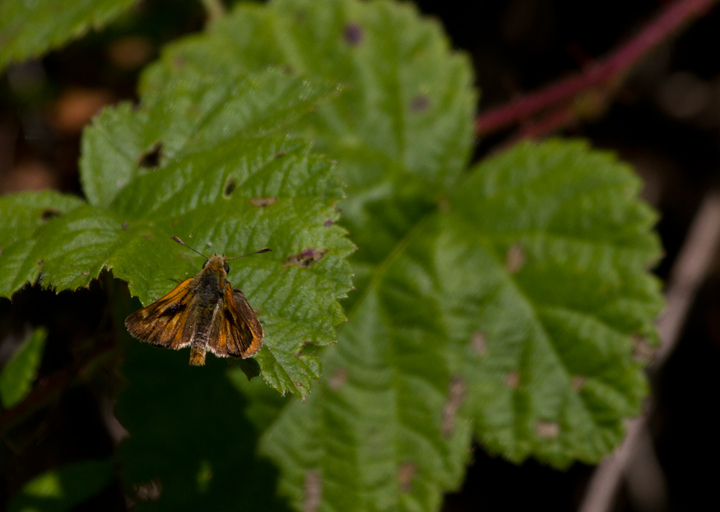 Below: A Woodland Skipper in Palo Colorado Canyon, California (7/1/2011). 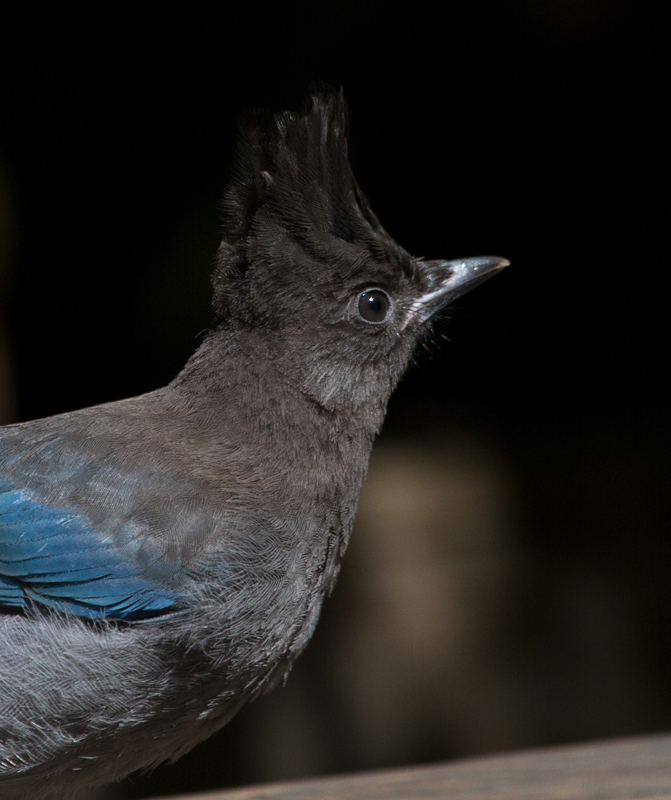 Below: A Steller's Jay poses for close-ups in Humboldt Redwoods SP, California (7/4/2011). 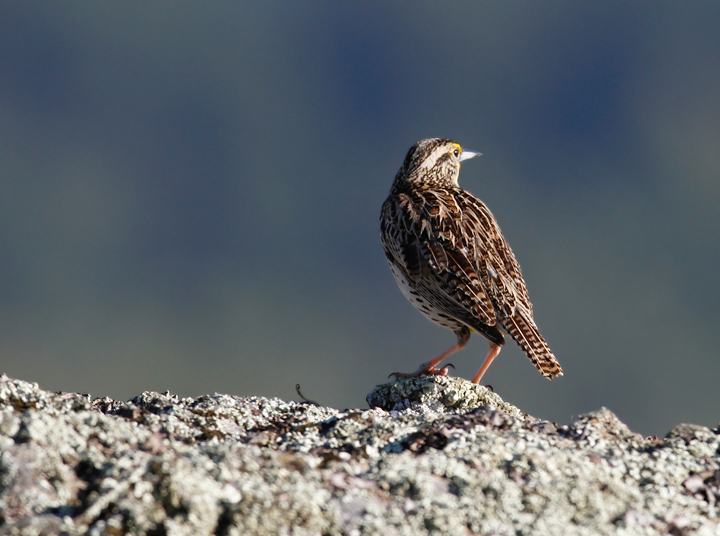 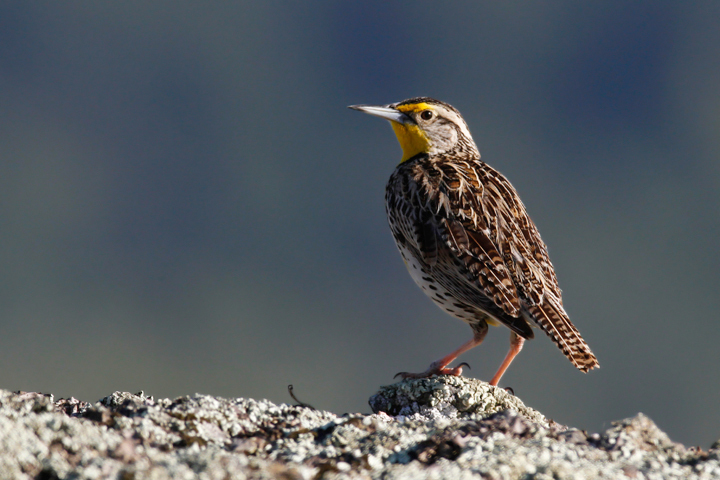 Below: A Western Meadowlark poses dramatically in the hills above Garberville, California (7/4/2011).